Saint Martin de Porres, Religious - My Catholic Life! Today’s saint was born in colonial Lima, Peru, to a well connected Spanish father and a black Panamanian mother who had been a slave. A person’s parentage is revealing, no doubt. But a unique focus on origins can also be an all-too-easy anthropological shortcut which reduces a complex person to mere bloodlines, leaving aside a thousand more compelling factors that make a life interesting. In the case of Martin de Porres, it would be difficult to overemphasize how his mulatto (Spanish & black) origins impacted his life. Even though his father was perfectly well known, Martin’s baptism registration reads “Son of an unknown father,” making Martin illegitimate. To be half black in colonial Latin America was to start life’s race ten miles behind. Catching up to the Spanish born (Peninsulares) or to the locally born pure blood Spanish (Criollos) was impossible. On the many runged ladder of social acceptability in the Spanish colonies, Martin was just above an African slave. Martin’s father did make sure, however, that his son received a good education and enrolled him as a barber-surgeon apprentice in Lima. Martin learned how to set fractures, to dress wounds, and to treat infections according to the best practices of his era. And from his mother he learned some unconventional herbal remedies that balanced his more traditional medical education. These skills would hold Martin in good stead throughout his life. He treated the sick and injured regularly and, over time, developed a reputation as an extraordinary healer. He aided in founding a hospital and orphanage in Lima, distributed food to the poor, and cared for recently arrived African slaves. His extraordinary charity was his greatest attribute. You need candles? Of course. Blankets? One moment, please. Sweets, shoes, and a comb? I’ll be back. Miracles and cures? Yes, God bless you. Martin de Porres became famous for doing many things—very many things—and doing them all well and with a smile. In addition to his life of service, Martin was also a spiritual warrior. He became a Dominican lay brother but never a priest. He lived in community and proudly wore the Dominican habit. He had a self-deprecating sense of humor that jokingly acknowledged his lowly mulatto status. He abstained from meat, spent long hours in prayer before the Blessed Sacrament, and was witnessed displaying supernatural gifts. He levitated. He bilocated. His room filled with light. He possessed knowledge he could in no way have possessed naturally. His wide array of natural and supernatural gifts made him famous in Lima. When his life came to an end at the age of sixty, his body was publicly shown, and pieces of his habit were discreetly clipped away as relics. 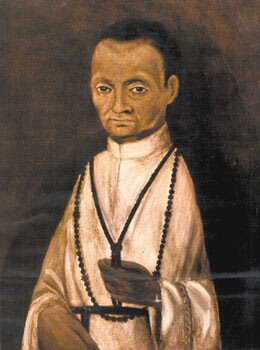 Saint Martin de Porres, who was canonized in 1962, was among the first generation of saints from the New World, along with his contemporaries Saints Rose of Lima and Turibius of Mongrovejo. Martin was also the first mulatto saint. He lived a traditionally pious spirituality in keeping with the medieval saints of Europe. But he was not from Europe, did not enjoy a European education or have pure European blood. Saint Martin proved the Catholic Faith could migrate across the Atlantic Ocean intact. The ancient faith found a home in a mulatto soul. Catholicism successfully made the passage to a new land. It would drive its roots deep into that land’s native soil, converting a new mixed-race people to an old religion, making Jesus Christ the Lord of Latin America. Saint Martin de Porres was a harbinger of the good things to come. Saint Martin de Porres, we present our humble petitions to you, so that your faith and humility may bring them to our Father in Heaven. You were close to both God and man on earth. Continue to be close to us as you live with the Lord in heaven and seek favors on our behalf.